This course, from the University of Edinburgh’s Reid School of Music (recently ranked first in the UK), is suitable for those who have never studied music academically. It will introduce you to the theory of Western music, providing you with the skills needed to read and write Western music notation, as well as to understand, analyse, and listen informedly. It will provide the basis for the further study of music both from a theoretical and practical point of view: musicology, pastiche and free composition, analysis, performance, and aural skills. It will also be useful to experienced musicians without music notation skills who wish to extend their practice through a grounding in the tools of Western music theory and notation. In July and August 2014 we ran a Fundamentals of Music Theory MOOC (massively open online course) at the University of Edinburgh. Now that the course is over I can’t link people to the coursera page (where it was hosted) but it will run again next summer (and the facebook page is still active). By the end of the course there were 90,000 total learners from 198 countries, with 31% from emerging economies. All in all there were more than 1 million lecture views (43,000 people watched at least one lecture), 17,000 people submitted an exercise (94,000 exercises were submitted in total), and 4,400 passed the course (2,000 submitted the final exam). There’s just one thing I want to underline here before we move on: All kinds of superb musicians get by just fine without reading or writing music. Being able to read and write Western musical notation does not make you a composer or musician, any more than not being able to read and write means you can’t compose or play. Understanding musical notation doesn’t necessarily even make you a better musician; in fact, you could argue that placing emphasis on reading and writing can come at the expense of listening, which is what music is really about. 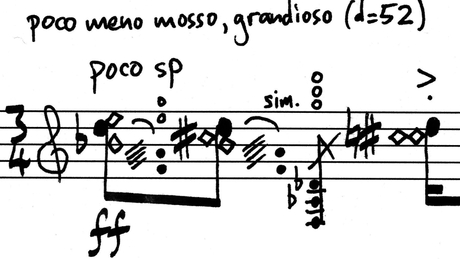 At best then, understanding music notation makes you a more rounded musician. It certainly does give you access to the amazing riches of centuries of notated music, and allows you to express, analyse, record, and symbolically develop musical ideas. Musical notation is an amazing development that’s had an astounding impact on Western musical culture and thought. But there’s nothing particularly challenging or difficult about notation. Mastering it is just a matter of familiarisation and practice. It’s generally a tool, not an end in itself. Thanks to my colleagues Zack Moir, Richard Worth, John Kitchen, and Nikki Moran for helping make this happen.